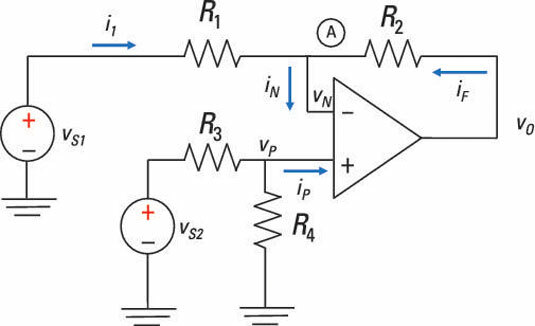 There’s a special op amp circuit —a differential amplifier, or subtractor — that is actually a combination of a noninverting amplifier and inverting amplifier. A differential amplifier multiplies the difference between two voltages. Here is an op amp subtractor. Turn on one source and turn off the others. Determine the output of the source that’s on. Repeat for each input, taking the sources one at a time. Algebraically add up all the output contributions for each input to get the total output. There you have it! You now have the output proportional to the difference between the two inputs.